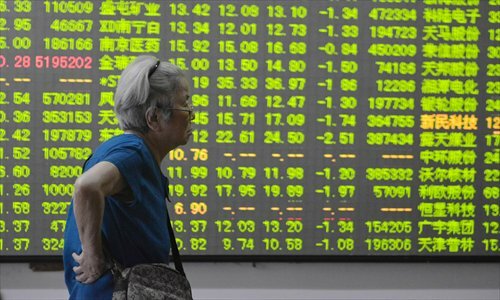 The China Securities Regulatory Commission (CSRC) late on Wednesday released a new set of loosened rules for margin trading, after mainland stock markets plunged again in afternoon trading on Wednesday. The CSRC also said that it would expand the financing channels for brokerages by allowing them to issue and transfer short-term corporate bonds as well as allowing them to offer asset-backed securitization services based on their margin trading and securities financing businesses. Also late on Wednesday, the Shanghai and Shenzhen bourses said that A-share transaction fees for both sellers and buyers would be reduced by 30 percent starting from August. The benchmark Shanghai Composite Index tumbled 5.23 percent or 223.52 points to 4,053.70 points Wednesday, while the Shenzhen Component Index fell by 4.79 percent or 687.15 points to close at 13,650.82 points. ChiNext, the country's NASDAQ-style board for high-tech and emerging start-ups, slumped 3.47 percent or 99.20 points to end at 2,759.41 points. Despite the recent fluctuations, the number of A-share investors has continued to grow over the past week. As of the end of last week, mainland stock markets had a total of 90.14 million individual investors, according to China Securities Depository and Clearing Co.
Analysts generally attributed Wednesday's big loss to investor concerns over shadow financing for stock purchases, also known as margin financing outside the brokerage system. "The most important reason behind the high volatility in recent days stems from the uncertainty surrounding margin lending outside brokerages," Yu Pingkang, chief economist at Huatai Securities, told the Global Times Wednesday. While high leverage has been one of the major drivers behind the A-share bull run that started in November 2014, margin lending from brokerages is only part of the funds investors have borrowed to buy shares. They have also borrowed from online lending sites and other non-brokerage channels. The outstanding volume of margin financing through three major non-brokerage platforms, including the Hithink Flush Information Network, amounts to about 500 billion yuan ($80.65 billion), according to data released Tuesday by the Securities Association of China (SAC). "So far, only a small portion of stocks purchased with money borrowed through unregulated margin financing have been sold, indicating that the market is under a lot of pressure from potential risks as most of such lending is still in the market," Yu Haihua, chief analyst at Bohai Securities, told the Global Times Wednesday. The actual amount of the money borrowed through non-brokerage channels is still unknown, and many market participants believe it may be much higher than the SAC's figure of 500 billion yuan, according to Yu from Huatai Securities. This makes it a big source of uncertainty for stock markets. "Daily turnover at the Shanghai Stock Exchange is currently around 800 billion yuan, much higher than the level of 200 billion yuan during the bull run in 2007," Yu Haihua explained. "With such a high trading volume, it is natural for markets to be much more volatile." The total capitalization of the A-share market had jumped from 37.25 trillion yuan at the end of 2014 to 58.46 trillion yuan as of Tuesday, up 56.94 percent during the six-month period. The Shanghai Composite Index rose by 32.23 percent during the same period, with the Shenzhen Component Index rising by 30.17 percent. But due to the deep plunge over the past two weeks, the Shanghai index ended June down 7.25 percent, marking the first monthly drop since January. The sharp correction has also led to speculation about other factors influencing the market. For instance, the China Financial Futures Exchange (CFFEX) on Wednesday denied rumors that overseas institutional investors including the Hong Kong unit of China Southern Asset Management Co and Goldman Sachs have been shorting the A-share market through index futures. According to the CFFEX, which hosts index futures of mainland stocks, 63 overseas institutions currently can only trade stock index futures for risk-hedging purposes, and China Southern Asset Management Co hasn't even had an account to trade index futures.